Author(s) Phipps, Mary; Quine, M.P. 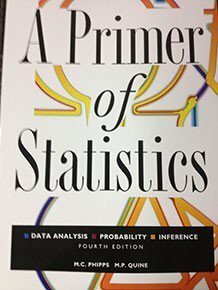 This edition of A Primer of Statistics is a clear and concise introduction to basic statistics. It allows students to understand and apply statistical techniques and principles. The book provides a comprehensive coverage of widely used methods of data analysis, probability and random variables and inference. It also incorporates a sound mathematical basis for the statistical reasoning behind the methods explained.